Download Rank Math SEO Plugin for Free – Rank Math is an advanced SEO Plugin for WordPress. It comes with a lot of advanced SEO functionalities which is making it famous in a short time. This is an absolutely free plugin by MyThemeShop.com and very easy to download Rank Math SEO Plugin. 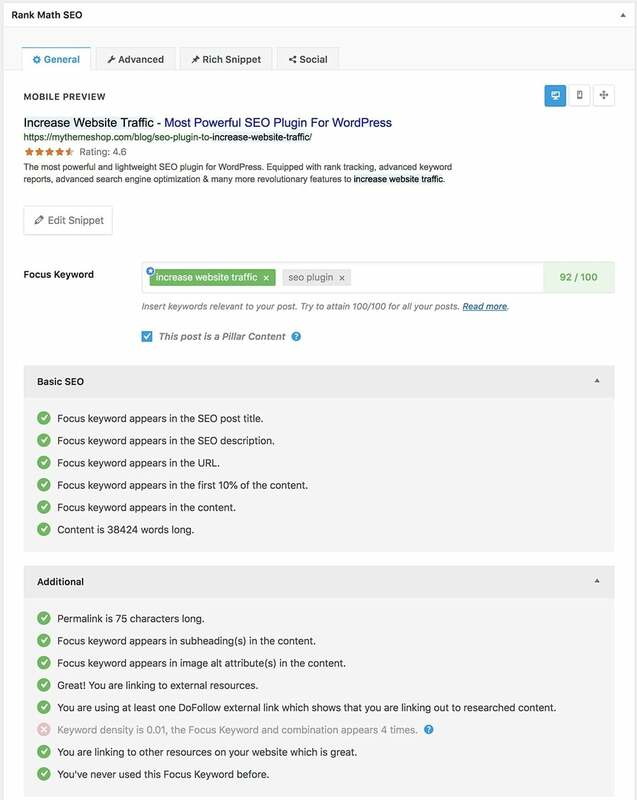 All blogger need an SEO plugin which helps us to better know how our post/article will perform on Google. Isn’t it? Of course, we need it. Rank Math is one of the best SEO plugins these days because it’s simplicity and advanced functionality. Rank Math is very simple to use. Its simple interface can’t disappoint a beginner nor advance user. The advance feature makes Rank Math more attractive. It has more features then Yoast SEO Premium and it is FREE. It has inbuilt keyword suggestion tool which helps when we enter focus keyword. Additionally. you can add up to 5 focus keyword. This is the feature which I like most. You don’t need to use another external plugin to show rich snippet on Google. You can show 14 different types of rich snippets on Google including rating, article, product, person, video etc. This is the premium feature in Yoast SEO but here is FREE. You can customize who your site/post will look on Facebook and Twitter. Step 1 – Go to the MyThemeShop official website. Step 2 – Sign in or Create an account. Step 3 – Go to download section and download Rank Math. Step 1 – Download Rank Math SEO Plugin. Step 2 – Go to WP Dashboard > Plugins > Add New > Upload. Step 3 – Upload the Plugin ZIP file. Step 4 – Activate the Plugin. Note: Currently, this plugin in progress mode which means some function may not work. If you have any query or suggestion, please contact us by this page.